Equine matting is heavy duty and made of recycled rubber and has been developed specifically for use in horse floats and stables. It contains a specialized bonding agent to ensure its longevity. 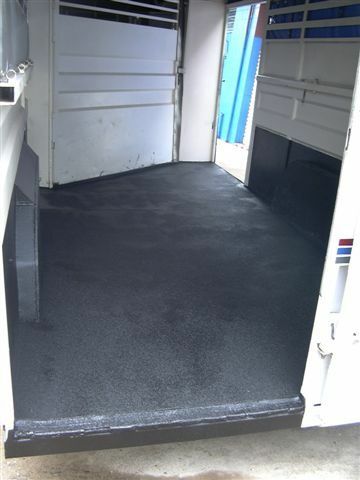 The ease of installation and non-slip qualities of Repeat Rubbers Horse Float matting makes it unique. The Equine Matting Roll is available in two thickness 5mm and 10mm, The 5mm is suitable for Horse float tail gates, Stable walls and Arena fences, The 10mm is used in more extreme application such as Horse float floors, Stable floors, Walkways and Wash down bays. The size of the Equine matting roll is 1.2m wide x 10L/m long and is 1000 kg/m3 density. We offer a wet pour installation service at our premises in Seaford Victoria for horse floats, trucks and trailers.